Gairia Volcano. Treeking routes in Canary Island. 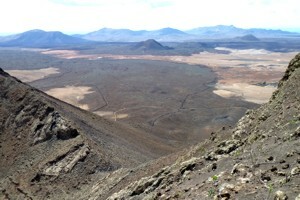 The The Gairía Volcano is one of the best preserved volcanoes Fuerteventura, and also one of the largest. Located in the center of the island, near the village of Tiscamanita, this volcano you see from many parts of the island, as it is in a fairly wide plain. To climb the volcano, it's best to go down the path from Casillas de Morales to Tiscamanita, and surrounding the volcano. About two kilometers of Casillas de Morales, the trail turns to the right to go to the volcano. We follow this road and see another detour to the right, which is one of the possible ways to climb, but that is only accessible from August to March, with no trespassing the other months as it is a growing area of protected birds. We follow the path until you reach the side of the volcano which is open due to the overflow of the boiler and which caused a large cast of volcanic rocks. I recommend climbing the left side, which goes directly to the top of the volcano, as the right side is more complicated to climb. You have to climb slowly, because this area is somewhat dangerous due to the steep slope of the mountain. From the top there are stunning views of 360 degrees that cover a large part of the island, besides being able to see a well-preserved volcanic caldera. In short, the rise is something hard in its final stretch, but with stunning landscapes.